The special administrative regions (SAR) are one type of provincial-level administrative divisions of China directly under Central People's Government. They possess the highest degree of autonomy. The legal basis for the establishment of SARs, unlike the administrative divisions of Mainland China, is provided for by Article 31, rather than Article 30, of the Constitution of the People's Republic of China of 1982. Article 31 reads: "The state may establish special administrative regions when necessary. The systems to be instituted in special administrative regions shall be prescribed by law enacted by the National People's Congress in the light of the specific conditions". At present, there are two SARs established according to the Constitution, namely the Hong Kong SAR and the Macau SAR, former British and Portuguese dependencies respectively, transferred to China in 1997 and 1999 respectively pursuant to the Sino-British Joint Declaration of 1984 and the Sino-Portuguese Joint Declaration of 1987. Pursuant to their Joint Declarations, which are binding inter-state treaties registered with the United Nations, and their Basic laws, the Chinese SARs "shall enjoy a high degree of autonomy". There is additionally the Wolong Special Administrative Region in Sichuan province, which is however not established according to Article 31 of the Constitution. Generally, the two SARs are not considered to constitute a part of Mainland China, by both Chinese and SAR authorities. The provision to establish special administrative regions appeared in the constitution in 1982, in anticipation of the talks with the United Kingdom over the question of the sovereignty over Hong Kong. It was envisioned as the model for the eventual reunification with Taiwan and other islands, where the Republic of China has resided since 1949. Special administrative regions should not be confused with special economic zones, which are areas in which special economic laws apply to promote trade and investments. Under the One country, two systems principle, the two SARs continue to possess their own governments, multi-party legislatures, legal systems, police forces, monetary systems, separate customs territory, immigration policies, national sports teams, official languages, postal systems, academic and educational systems, and substantial competence in external relations that are different or independent from the People's Republic of China. Special administrative regions should be distinguished from the constituent countries system in the United Kingdom or Kingdom of the Netherlands. There are currently two special administrative regions established according to Article 31 of the Chinese Constitution. For the Wolong Special Administrative Region in Sichuan province, please see the section § Wolong below. The two special administrative regions of Hong Kong and Macau (created in 1997 and 1999 respectively) each have a codified constitution called Basic Law. The law provides the regions with a high degree of autonomy, a separate political system, and a capitalist economy under the principle of "one country, two systems" proposed by Deng Xiaoping. Currently, the two SARs of Hong Kong and Macau are responsible for all affairs except those regarding diplomatic relations and national defense. Consequently, the National People's Congress authorizes the SAR to exercise a high degree of autonomy and enjoy executive, legislative and independent judicial power, and each with their own Courts of Final Appeal. Special administrative regions are empowered to contract a wide range of agreements with other countries and territories such as mutual abolition of visa requirement, mutual legal aid, air services, extradition, handling of double taxation and others, with no Chinese Government involvement. However, in some diplomatic talks involving a SAR, the SAR concerned may choose to send officials to be part of the Chinese delegation. For example, when former Director of Health of Hong Kong Margaret Chan became the World Health Organization (WHO) Director-General, she served as a delegate from the People's Republic of China to the WHO. In sporting events the SARs participate under the respective names of "Hong Kong, China" and "Macau, China", and compete as different entities as they had done since they were under foreign rules, but both SARs are usually allowed to omit the term ", China" for informal use. The Government of Hong Kong has established Hong Kong Economic and Trade Offices (HKETOs) in few countries as well as Greater China Region. HKETOs serve as a quasi-interests section in favor of Hong Kong. For regions with no HKETOs, Chinese diplomatic missions take charge of protecting Hong Kong-related interests. Some countries which have a diplomatic relationship with the central Chinese government maintain Consulate-General offices in Hong Kong. The People's Liberation Army is garrisoned in both SARs. PRC authorities have said the PLA will not be allowed to interfere with the local affairs of Hong Kong and Macau, and must abide by its laws. In 1988, scholar Chen Fang of the Academy of Military Science even tried to propose the "One military, two systems" concept to separate the defence function and public functions in the army. The PLA does not participate in the governance of the SAR but the SAR may request them for civil-military participation, in times of emergency such as natural disasters. Defence is the responsibility of the PRC government. A 1996 draft PRC law banned People's Liberation Army–run businesses in Hong Kong, but loopholes allow them to operate while the profits are ploughed back into the military. There are many PLA-run corporations in Hong Kong. The PLA also have sizable land holdings in Hong Kong worth billions of dollars. resided continuously and legally for seven or more years in the SAR and therefore gained a right of abode in the SAR. Apart from affording the holder consular protection by the Ministry of Foreign Affairs of the People's Republic of China, these passports also specify that the holder has right of abode in the issuing SAR. The National People's Congress has also put each SAR in charge of administering the PRC's Nationality Law in its respective realms, namely naturalization, renunciation and restoration of PRC nationality and issuance of proof of nationality. Due to their colonial past, many inhabitants of the SARs hold some form of non-Chinese nationality (e.g. British National (Overseas) status, British citizenship, British Overseas citizenship or Portuguese citizenship). However, SAR residents who are Chinese descent have always been considered as Chinese citizens by the PRC authorities, an exception to this case is Macau, wherein residents of Chinese descent may choose Chinese or Portuguese nationality. Special interpretation of the Nationality Law, while not recognizing dual nationality, has allowed Chinese citizens to keep their foreign "right of abode" and use travel documents issued by the foreign country. However, such travel documents cannot be used to travel to mainland China and persons concerned must use Home Return Permit. Therefore, master nationality rule applies so the holder may not enjoy consular protection while in mainland China. Chinese citizens who also have foreign citizenship may declare a change of nationality at the Immigration Department of the respective SARs, and upon approval, would no longer be considered Chinese citizens. SAR permanent residents who are not Chinese citizens (including stateless persons) are not eligible for SAR passports. Persons who hold a non-Chinese citizenship must obtain passports from foreign diplomatic missions which represents their countries of citizenship. For those who are stateless, each SAR may issue its own form of certificates of identity, e.g. Document of Identity, in lieu of national passports to the persons concerned. Chinese citizens who are non-permanent residents of two SARs are also ineligible for SAR passports but may obtain CIs just like stateless persons. The status of a special administrative region for Taiwan and other areas controlled by the Republic of China was first proposed in 1981. The 1981 proposal was put forth by Ye Jianying called "Ye's nine points" (葉九條). A series of different offers have since appeared. On 25 June 1983 Deng Xiaoping appeared at Seton Hall University in the US to propose "Deng's six points" (鄧六條), which called for a "Taiwan Special Administrative Region" (台灣特別行政區). 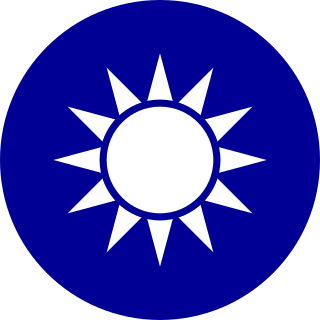 It was envisioned that after Taiwan's unification with the PRC as an SAR, the PRC would become the sole representative of China. Under this proposal, Taiwan would be guaranteed its own military, its own administrative and legislative powers, an independent judiciary and the right of adjudication, although it would not be considered a separate government of China. In 2005 the Anti-Secession Law of the PRC was enacted. It promises the lands currently ruled by the authorities of Taiwan a high degree of autonomy, among other things. The PRC can also employ non-peaceful means and other necessary measures to defend its claims to sovereignty over the ROC's territories in the event of an outright declaration of independence by Taiwan (ROC). Taiwan would be a special administrative region of China, and part of the PRC. The ROC would no longer exist. Taiwan's institutions would metamorphose into sub-national bodies. From Hong Kong's experience, they would likely be organized to preclude groups and leaders deemed unsuitable to Beijing from political participation. Taiwan's social system and economic lifestyle would be respected. Taiwan's private property rights, belief systems, and "legitimate rights and interests" would be safeguarded. The "Taiwan issue" should not be passed down from generation to generation (i.e. reunification should be done promptly). The reunification of Taiwan would lead to the "great rejuvenation of the Chinese nation". The Wolong Special Administrative Region (Chinese: 卧龙特别行政区; pinyin: Wòlóng Tèbié Xíngzhèngqū) is located in the southwest of Wenchuan County, Ngawa Tibetan and Qiang Autonomous Prefecture of Sichuan. It was formerly known as Wolong Special Administrative Region of Wenchuan County, Sichuan Province and was founded in March 1983 with approval of the State Council. It was given its current name and placed under Sichuan provincial government with administrative supervision by the provincial department of forestry. Its area supersedes Sichuan Wolong National Nature Reserve and its administrative office is the same as the Administrative Bureau of the State Forestry Administration for the reserve. It currently has a population of 5343. Despite its name, the Wolong Special Administrative Region is not an SAR as defined by Article 31 of the Constitution of the People's Republic of China; as a result, it has been proposed the Wenchuan Wolong Special Administrative Region of Sichuan Province change its name, with designations such as special area or township. Chahar was made a special administrative region in 1914 by the Republic of China, as a subdivision of the then Zhili Province, with 6 banners and 11 counties. In 1928 it became a province, with 5 of its counties partitioned to Suiyuan, and 10 counties were included from Hebei. ^ "Mid-year Population for 2014". Census and Statistics Department (Hong Kong). 12 August 2014. Archived from the original on 6 October 2014. Retrieved 5 October 2014. ^ "Demographic Statistics for the 2nd Quarter 2014". Statistics and Census Service of the Government of Macau SAR. 11 August 2014. Archived from the original on 14 November 2014. Retrieved 5 October 2014. ^ Lauterpacht, Elihu. Greenwood, C. J. (1999). International Law Reports Volume 114 of International Law Reports Set Complete set. Cambridge University Press, 1999. ISBN 0521642442, 9780521642446. p 394. ^ a b c d Ghai, Yash P. (2000). Autonomy and Ethnicity: Negotiating Competing Claims in Multi-Ethnic States. Cambridge University Press. ISBN 0521786428, 9780521786423. p 92. ^ a b Zhang Wei-Bei. (2006). Hong Kong: the pearl made of British mastery and Chinese docile-diligence. Nova Publishers. ISBN 1594546002, 9781594546006. ^ Chan, Ming K. Clark, David J. (1991). The Hong Kong Basic Law: Blueprint for Stabiliree Legal Orders – Perspectives of Evolution: Essays on Macau's Autonomy After the Resumption of Sovereignty by China. ISBN 3540685715, 9783540685715. p 212. ^ Oliveira, Jorge. Cardinal, Paulo. (2009). One Country, Two Systems, Three Legal Orders – Perspectives of Evolution: Essays on Macau's Autonomy After the Resumption of Sovereignty by China. ISBN 3540685715, 9783540685715. p 212. ^ English.eastday.com. English.eastday.com Archived 21 January 2012 at the Wayback Machine. "China keeps low key at East Asian Games." Retrieved on 2009-12-13. ^ a b c d Gurtov, Melvin. Hwang, Byong-Moo Hwang (1998). China's Security: The New Roles of the Military. Lynne Rienner Publishing. ISBN 1555874347, 9781555874346. pp. 203–204. ^ "Macau SAR Identification Department". www.dsi.gov.mo. Archived from the original on 6 November 2016. Retrieved 6 November 2016. ^ a b United Nations refugee agency. "UNHCR Archived 18 October 2012 at the Wayback Machine." Anti-Secession Law (No. 34). Retrieved on 2009-12-14. ^ Bush, Richard C. (7 January 2019). "8 key things to notice from Xi Jinping's New Year speech on Taiwan". Brookings. Retrieved 9 January 2019. ^ a b c d e f g h Bush, Richard C. (7 January 2019). "8 key things to notice from Xi Jinping's New Year speech on Taiwan". Brookings. Retrieved 9 January 2019. ^ "A Brief Review of the Special Administrative Regions and the Special Administrative Region System" (PDF). Archived (PDF) from the original on 11 July 2015. Retrieved 10 July 2015. Under the Basic Law, the Hong Kong Special Administrative Region is exclusively in charge of its internal affairs and external relations, whilst the Government of the People's Republic of China is responsible for its foreign affairs and defence. As a separate customs territory, Hong Kong maintains and develops relations with foreign states and regions, and plays an active role in such international organisations as World Trade Organization (WTO) and the Asia-Pacific Economic Cooperation (APEC) in its own right under the name of Hong Kong, China. Hong Kong participates in 16 projects of United Nations Sustainable Development Goals. Mainland China, also known as the Chinese mainland, is the geopolitical as well as geographical area under the direct jurisdiction of the People's Republic of China (PRC). 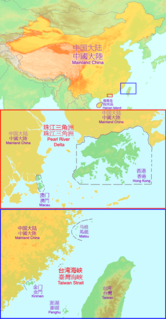 It includes Hainan island and strictly speaking, politically, does not include the special administrative regions of Hong Kong and Macau, even though both are partially on the geographic mainland. "One country, two systems" is a constitutional principle formulated by Deng Xiaoping, the Paramount Leader of the People's Republic of China (PRC), for the reunification of China during the early 1980s. He suggested that there would be only one China, but distinct Chinese regions such as Hong Kong and Macau could retain their own economic and administrative systems, while the rest of the PRC uses the socialism with Chinese characteristics system. Under the principle, each of the two regions could continue to have its own governmental system, legal, economic and financial affairs, including trade relations with foreign countries. The Hong Kong Special Administrative Region Passport is a passport issued only to the permanent residents of Hong Kong who also hold Chinese citizenship. 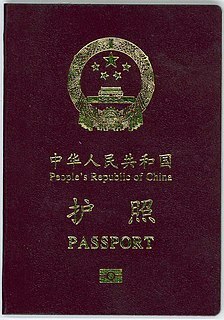 In accordance with the Basic Law of the Hong Kong Special Administrative Region, since the transfer of sovereignty on 1 July 1997, the passport has been issued by the Immigration Department of the Government of Hong Kong under the authorisation of the Central People's Government of the People's Republic of China. As the official languages of Hong Kong are Chinese and English, the passport is printed bilingually in both Chinese and English. The Hong Kong Special Administrative Region Document of Identity for Visa Purposes is a biometric travel document issued by the Hong Kong Immigration Department to residents of Hong Kong who are unable to obtain a national passport. It is usually valid for seven years. The Nationality Law of the People's Republic of China regulates nationality of the People's Republic of China. Chinese nationality is usually obtained either by birth when at least one parent is of Chinese nationality or by naturalization. The Macao Special Administrative Region passport is a passport issued to Chinese citizens who are permanent residents of Macau. The People's Republic of China passport, commonly referred to as the Chinese passport, is the passport issued to nationals of the People's Republic of China (PRC) who have registered as a resident of Mainland China hence hold a hukou, for the purpose of the international travel and entitles the bearer to the protection of China's consular officials overseas. The Nationality Law defines and regulates the acquisition, loss, restoration, and revocation of the nationality of the Republic of China (ROC), commonly known as Taiwan. Nationality is in the jurisdiction of the Ministry of the Interior and is based on jus sanguinis. 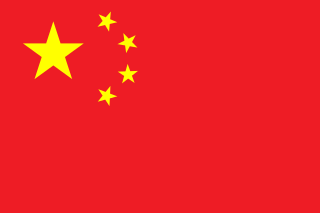 The flag of China, also known as the Five-starred Red Flag, is a red field charged in the canton with five golden stars. The design features one large star, with four smaller stars in a semicircle set off towards the fly. 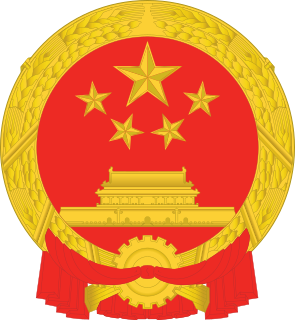 The red represents the communist revolution; the five stars and their relationship represent the unity of the Chinese people under the leadership of the Communist Party of China (CPC). The first flag was hoisted by the People's Liberation Army (PLA) on a pole overlooking Beijing's Tiananmen Square on 1 October 1949, at a ceremony announcing the establishment of The People's Republic of China. The Wolong Special Administrative Region is an area in Sichuan, China. It is located in the southwest of Wenchuan County, Ngawa Tibetan and Qiang Autonomous Prefecture of Sichuan. It was formerly known as Wolong Special Administrative Region of Wenchuan County, Sichuan Province and was founded in March 1983 with approval of the State Council. It was given its current name and placed under Sichuan provincial government with administrative supervision by the provincial department of forestry. Its area supersedes Sichuan Wolong National Nature Reserve and its administrative office is the same as the Administrative Bureau of the State Forestry Administration for the reserve. It currently has a population of 5343.